Villa Susanna is a tropical paradise secluded above Marigot Bay. It’s wooden exterior and lush gardens contrasts beautifully with the modern interiors and top of the line appliances. All four buildings are independent, with two suites, a sitting area, and a coffee bar in each. 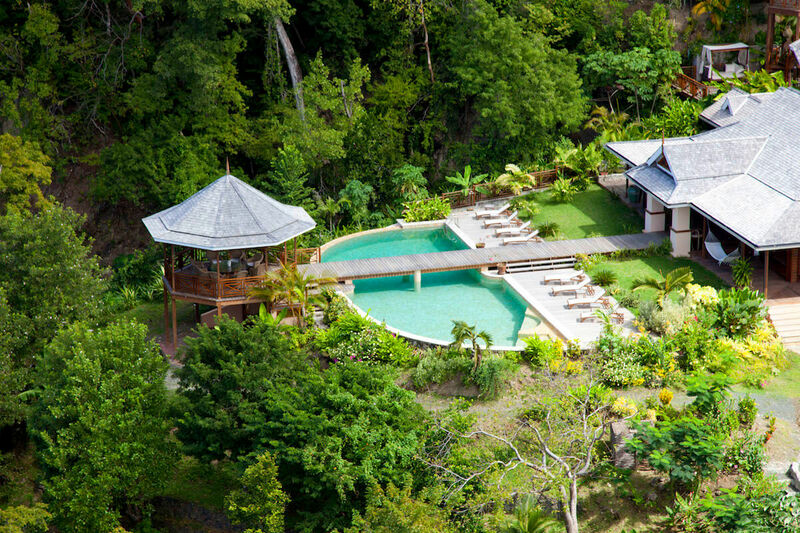 Villa Susanna is situated amidst the lush forests of Roseau above Marigot Bay. The house is an eclectic mix of Caribbean and Mediterranean styles, and can accommodate 14 people. Outside on the patio, guests can relax in chairs and a hammock, or walk through the garden to the 20-meter pool. A wooden bridge over the pool leads to the sunset gazebo above the ocean. The gazebo has a round, glass table and chairs that can seat 14 people. Guests have three acres of fully landscaped gardens to wind through, and paths lead down to Trou Rolland Beach, a BBQ grill, and tables. Villa Susanna also offers its motor boat, Red Sunset, twice a week for exploring the coastline or deep-sea fishing. The boat has two 275 HP engines with a cabin and shower, and is captained by Skipper Ben. The whole property is protected by a virtual fence with lights and security cameras. A central living and dining area with vaulted ceilings and terra cotta floors leads to the gourmet kitchen and the patio. The living area has ample seating, a flatscreen TV, and an entertainment system, while the dining table can seat 20. The kitchen opens to a courtyard with a brick oven and dining space. It’s sleek cabinetry and appliances hold a Nespresso machine, a food processor, a juicer, two ovens, a gas stove, and a double door fridge and freezer. Housekeeping comes seven days a week, a chef is available five days a week for breakfast and lunch for a seven day rental, and the gardener and pool man maintain the exterior as needed. There’s also a generator that switches on automatically if a power outage occurs. Amber Flamboyant Cottage is home to the master bedroom, a sitting area, a kitchenette, and a library. The bedroom has a four-poster king bed draped with nets, air-conditioning, and two sets of louvre doors that open to a private patio. The cottage is equipped with a TV, a radio, a docking station, a walk-in closet, a safe, and an ensuite bathroom. The patio has a small Jacuzzi, an outdoor shower, and two loungers. The sitting area and kitchenette have a wet bar, a fridge, and a coffee station. The library has a sofa that can convert to a queen bed, air-conditioning, a ceiling fan, a TV, an ensuite bathroom, and WiFi. There’s also a private garden with a hammock. Yellow Heliconia Cottage has two bedrooms, a garden, and a sitting area. The first suite has a four-poster king bed, air-conditioning, a ceiling fan, a TV, and access to the garden’s outdoor shower. The second suite has two twin beds, air-conditioning, a ceiling fan, a TV, a docking station, a safe, an ensuite bathroom, and access to the garden’s hammock. The sitting area has a wet bar, a fridge, and a coffee bar. White Frangipani Cottage consists of two bedrooms and a sitting area. The first suite has two twin beds, air-conditioning, a ceiling fan, a TV, a safe and an ensuite bathroom. This suite is linked to the other bedroom by the sitting area, which has a wet bar, a fridge and a coffee bar. The second suite has a king bed, air-conditioning, ceiling fans, a TV, and an ensuite bathroom. Lastly, Traveller’s Palm apartment is situated on the same level as the main house’s living area and has a queen bed, air-conditioning, a ceiling fan, and an ensuite bathroom. The bedrooms’ air-conditioning is climate-controlled. Marigot Bay is a quiet bay that’s near the St. Lucian National Marine Reserve. Villa Susanna is largely secluded, but dining in Castries is a short drive away. Short walk down a winding path to the sandy/pebbble Trou Rolland beach. Daily housekeeping from 8:30AM to 3:30 PM, Breakfast and lunch services 5 days a week for 7 day rental or 3 days a week for a 5/6 day rental between the hours of 8AM - 3PM Monday - Friday, use of a 33 ft speedboat twice a week (Tuesday and Thursday if you stay 7 nights) or once for a 5 day rental under captaincy of Skipper Ben, and use of beach chairs and sport equipment at the water sport activity hut on Lasbas Beach.